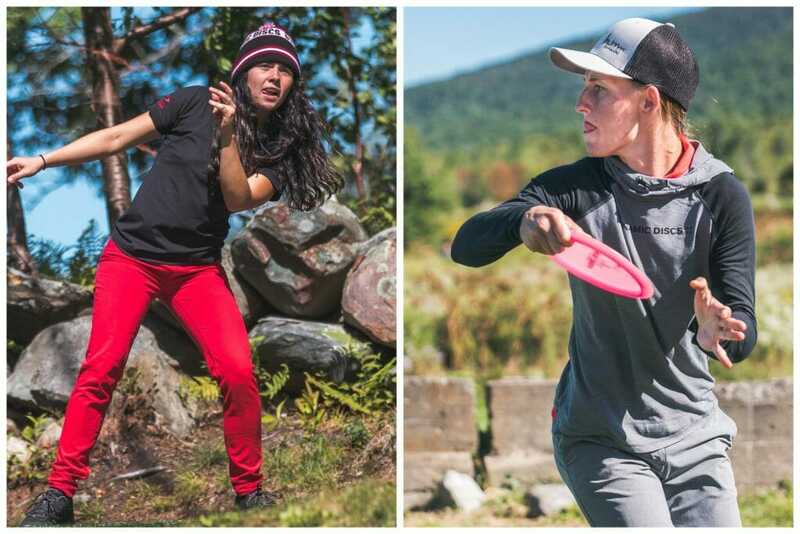 The final Open Women’s lead card of the PDGA Professional World Championship is set. It was another rough round for the division, with the average score nearly two full strokes worse than it was the first time they played Fox Run Meadows as the wind picked up on Saturday causing discs to flip and find the numerous out of bounds spots. Save for one familiar name, the penultimate round was filled with big scores, with the field just trying to hang on, and hope to stay in contention for Sunday. Paige Pierce struggled mightily at Brewster Ridge on Friday, and it looked like she may have played her way out of the running for a repeat world championship. But on Saturday, she was finally able to put it together, birdieing 44-percent of her holes, which doubled the next best rate, and avoiding a triple bogey in the round for the first time this tournament. Pierce finished with a 1010-rated, 2-under 61, which was the hot round by five strokes, and seven strokes better than the leader Paige Bjerkaas. Pierce is now sitting in second place at 11-over par 259 total. Pierce did most of her damage on the back nine. After double bogeying hole 10, she shot 4-under par to close out the round. She birdied holes 12, 14, 16, and 17. She was the only player birdie on both hole 12 and 16, the fourth and fifth hardest holes on the course according to UDisc Live stats. Pierce made up four strokes on Bjerkaas on those two holes alone. It seemed like things just finally started to go Pierce’s way in round four. That was most evident on hole 18, when her drive was headed easily out of bounds. 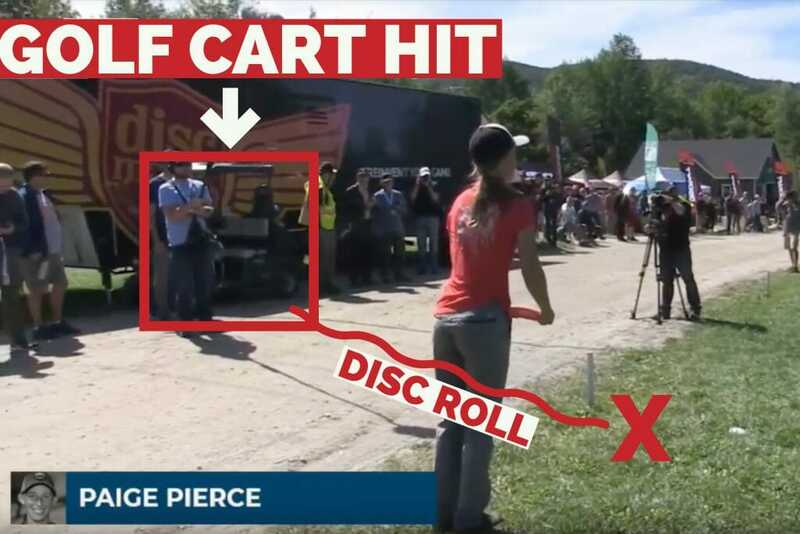 Upset with her throw, Pierce turned around and didn’t see the skip off the left side road, careening off of a golf cart, and slowly rolling just back in bounds. It saved Pierce from taking a penalty stroke, and kept her bogey free after hole 10. “It was my day on the course, and everything was going my way. I was getting good kicks, I was hitting good putts, it was special I guess,” said Pierce when asked about her fortune on hole 18. The solid round puts her within striking distance going into championship Sunday. That has to be an unsettling thought for the current leader, Paige Bjerkaas. If Pierce is hot, she’s already shown she’s capable of attacking Fox Run better and getting more birdies than anyone else. After a rough first couple rounds, and a dreadful third, Pierce finally put together a Pierce-like round, and just like that, she’s in real contention for another world title. After a nearly flawless second round on Fox Run, Paige Bjerkaas showed signs of nerves and found some bad luck on Saturday. She was 10 strokes worse than her 1021-rated round on Thursday, and the big difference were the OB strokes. Her first drive of the day, in fact, turned over right away and landed in the staked-off area. She wound up taking a double bogey. Bjerkaas would take a triple bogey two holes later, when her drive took an unlucky kick and roll out of bounds, and then her approach shot hit the pin, and slowly rolled down the hill and out of bounds again. It was a bout of truly terrible luck and it put Bjerkaas at 5-over par on the round after three holes. She came right back with two birdies over the next three holes, but more OB the rest of the day resulted in two more double bogeys. Bjerkaas did a spectacular job of avoiding out of bounds her first time out on Fox Run, but in the wind, even her conservative putter approach struggled to stay between the lines. And she also struggled with the putter, hitting just 81-percent of her Circle 1 putts. The wind played a factor there too, but she also came up short on a couple of gimmes. Bjerkaas did hold onto the lead though, despite her struggles. She finished the day in first at 6-over par 254 total after a 5-over par 68 round. It’s still a five stroke advantage, but it somehow feels more perilous even though there’s now just one round remaining. Pierce may have closed the gap, but it is supposed to be less windy on Sunday, and Bjerkaas does still have the lead, so it’s not panic time for her yet. Sarah Hokom had her first truly bad round of the tournament in round four. She hadn’t yet found a great round coming into the day, but had stuck around in second place by avoiding big scores. But things fell apart a bit on Saturday. Hokom went 8-over par 71, after having posted just 6-over par through the first three rounds combined. She is in third at 14-over par 262 total. Things started pretty well for Hokom. She had an easy birdie on hole 1 while Bjerkaas double bogeyed. That three shot swing got Hokom to within two of the lead. When she bogeyed hole 3 while Bjerkaas tripled, she was tied for the lead. But it unraveled for Hokom after that, particularly on hole 7. She threw out of bounds three straight times, twice on throws that turned over and it didn’t come back, and then on an overstable throw that faded too far. She ended up taking a nine on the par 5, and that only started the bad stretch. She bogeyed each of the next three holes, giving up five shots to Bjerkaas in the process. It’ll be difficult for her to do enough in the final round to make up the eight strokes necessary to catch Bjerkaas. But she did do enough to hang onto a place on the lead card, so it’s not out of the realm of possibility. Rebecca Cox has still been unable to recapture the magic of her 1-under par first round, but with her performance on Saturday, she managed to do something just one other player has been able to do this weekend: stay on the lead card for every round. Division leader Bjerkaas is the only other player to manage that. Cox will have to battle through the pain in the final round, but she’s already put together a solid tournament. She’s in more of a battle to stay in the top four than she is to make a play for first, but that would still be a solid ending for a solid year for Cox. The lead women’s card of Bjerkaas, Pierce, Hokom, and Cox tees off at 8:50 am local time on Fox Run Meadows. Smashboxx TV will be livestreaming the round. Follow along here at Ultiworld Disc Golf for coverage, and check UDisc Live for up-to-the-minute scoring. Comments on "Bjerkaas Holding Strong At Pro Worlds"